Every year ivory poachers kill upward of 50,000 African elephants, reducing that population from an estimated 1.3 million in 1979 to 350,000 today. The trend could make African elephants extinct within a decade. This is important because the animals, by eating and pooping, support the survival of fruit and tree species in Africa’s forests, which are the second most important resource globally for soaking up and processing carbon in the atmosphere. Sam Wasser established a method to extract genetic material from elephant dung and ivory. Science is providing a novel approach to attack the problem at its source. University of Washington researchers Sam Wasser and Lisa Brown are using forensic genetics and biostatistics to reveal ivory-poaching hotspots that help focus efforts to combat the crime. With this geographic and genetic information, Wasser and his team have mapped the locations of elephants across the African continent. 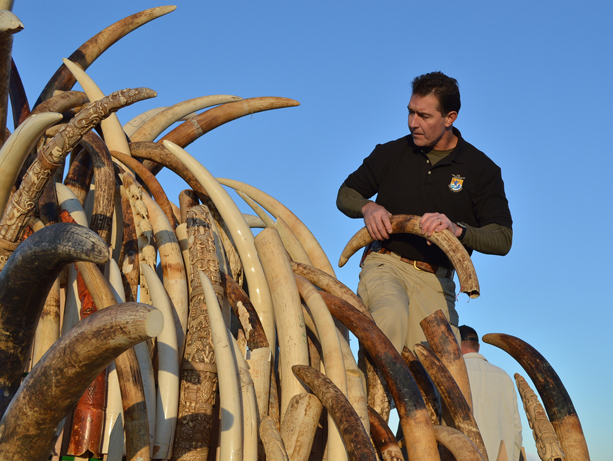 The UW center has, since 2004, used these methods to identify the location of origin of ivory seized by law-enforcement and wildlife authorities such as INTERPOL and the U.S. Fish and Wildlife Service. When large volumes of ivory are seized (over half a ton), a representative portion of the samples is sent to the center for genetic fingerprinting. “We use precision analysis – mathematical and computational models – to help assign a location to ivory samples of unknown origin,” said Lisa Brown, a UW doctoral student in biostatistics who worked on the project for four years. Although the reference map created by Wasser and colleagues does not have a sample for every location or every elephant population, biostatistical analyses and the genetic information helps discern a sample’s origin. “We use precision analysis ... to help assign a location to ivory samples of unknown origin,” said Lisa Brown. In addition, because elephant populations have been decimated, there are very few remaining regions in Africa that have enough elephants to supply large amounts of ivory. “We can approximate where the ivory came from to within 260 kilometers (160 miles) of its true origin, on average, and in some cases within 100 kilometers (62 miles),” Wasser said. Considering that most protected areas that still contain elephants are farther apart than that, the approximations help law enforcement identify where poaching is concentrated, act to stop it and, hopefully, prevent it. “Poachers change trafficking routes constantly. However, they can’t easily change where the ivory comes from,” Wasser added. The work being done by Wasser, Brown and their colleagues is also an example of how science can contribute to solving complex problems like wildlife crime.